Take a break from Srinagar with a short trip to Gulmarg Golf Course in Gulmarg, about 1h 45 min away. 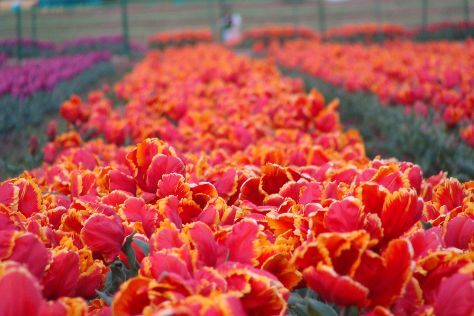 The adventure continues: admire the natural beauty at Indira Gandhi Tulip Garden, explore the ancient world of Pari Mahal, make a trip to Shankaracharya Hill, and contemplate the waterfront views at Nigeen Lake. To find other places to visit, reviews, and more tourist information, you can read our Srinagar itinerary planner . Mumbai to Srinagar is an approximately 6-hour flight. You can also do a combination of train, bus, and taxi; or take a bus. In May, Srinagar is cooler than Mumbai - with highs of 26°C and lows of 18°C. Finish up your sightseeing early on the 26th (Sun) so you can go by car to Anantnag. Anantnag /ə'nʌntna:g/ or /-nɑːg/ ; ''; "Countless springs") is a city and a municipality, capital of the Anantnag district in the Indian state of Jammu and Kashmir.EtymologyThe name Anantnag is derived from the Sanskrit term NH 44 (former name NH 1A before renumbering of all national highways)(India)|NH 44renumbering]] (former name NH 1A before renumbering of all national highways). Start off your visit on the 27th (Mon): take in the spiritual surroundings of Surya Temple at Martand, take in the spiritual surroundings of Kherbawani Asthapan, take in the spiritual surroundings of Mattan Temple, then take in the spiritual surroundings of Martand Sun Temple, and finally take in the pleasant sights at Baisaran. Get ready for a full day of sightseeing on the 28th (Tue): take in nature's colorful creations at Botanical Garden Kokernag. To find out how to plan a trip to Anantnag, use our trip itinerary maker. Traveling by car from Srinagar to Anantnag takes 2 hours. May in Anantnag sees daily highs of 26°C and lows of 18°C at night. Wrap up your sightseeing by early afternoon on the 28th (Tue) to allow enough time to drive to Pahalgam. Kick off your visit on the 29th (Wed): tee off at Pahalgam Golf Course and then admire the verdant scenery at Betaab Valley. On the 30th (Thu), you'll have a packed day of sightseeing: look for gifts at Khadi Bhandar, then make a trip to Chandanwari, and then admire the verdant scenery at Aru Valley. For more things to do, reviews, ratings, and more tourist information, use the Pahalgam tour planner. Traveling by car from Anantnag to Pahalgam takes 1.5 hours. In May, daily temperatures in Pahalgam can reach 26°C, while at night they dip to 18°C. Wrap up your sightseeing on the 30th (Thu) early enough to travel back home.